Apart from sweet mangos, Guimaras island has pristine white sand beaches. Locals say that the most beautiful beach in the island is Alubihod located in Nueva Valencia. Alibuhod beach has three resorts namely Raymen Beach Resort, California Coral Beach Resort and Alobihod Cove. During our 3 days and 2 nights trip in Guimaras Island, we spent our first night in Raymen Beach Resort. According to our tour guide, Raymen beach resort is the most frequented beach resort by locals and tourists from the nearby Iloilo province. I initially felt worried as I’m not a fan of crowded beach resorts. 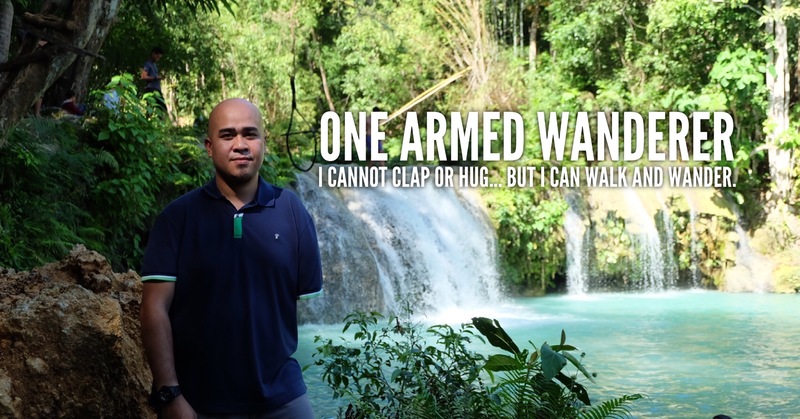 We were lucky that we visited Guimaras on November and it was an off-peak season. According to our tour guide, Alibuhod beach becomes crowed during summer season and holy week. Tip: If you want to fully enjoy the beauty of Alibuhod beach, visit Guimaras during off-peak season. There are many beach resorts in Guimaras but only few offer direct access to beachfront. Raymen Beach Resort Guimaras is one of these resorts. You get to enjoy the fine white sands and crystal clear waters of Alibuhod beach if you’re staying in Raymen. The resort has beachfront rooms and huts for day tour guests which are literally few steps away from the shore. Just like any other white beaches in the Philippines, Raymen Beach Resort’s Alibuhod beach in Guimaras offers calming view of the sea. The white sands may not be fine as Boracay’s but is comparable to the fine white sands of Bantayan Island in Cebu and Cagbalete Islands in Quezon. The beach is not rocky so you need not to worry if you forgot your aqua shoes. If you love sun basking, there are no beach beds in the resort. I would highly recommend you bring sarong instead. There are also buoys in the beach for safety purposes. If you are on a budget and is looking for a cheap resort in Guimaras, you should consider Raymen Beach Resort. 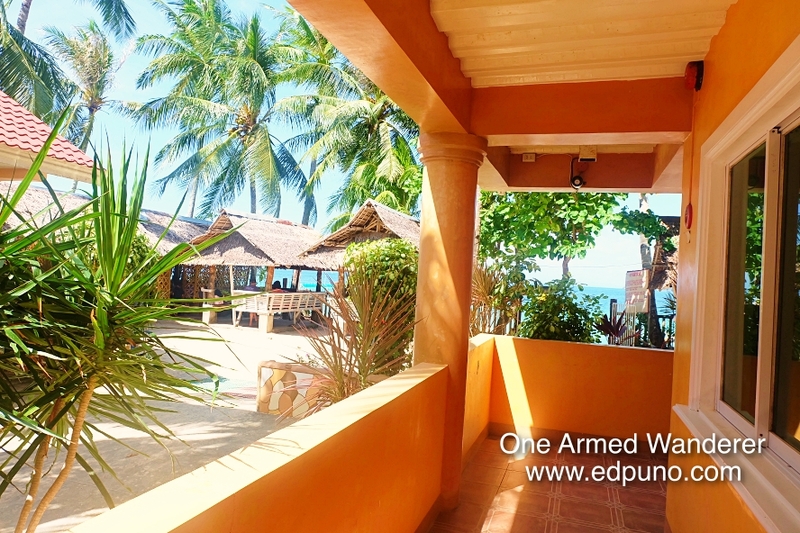 An overnight stay for 2 in a beachfront room is only 1,650 Php. They also have huts for rent for as low as 600 Php. Truly a budget-friendly beach resort in Guimaras! 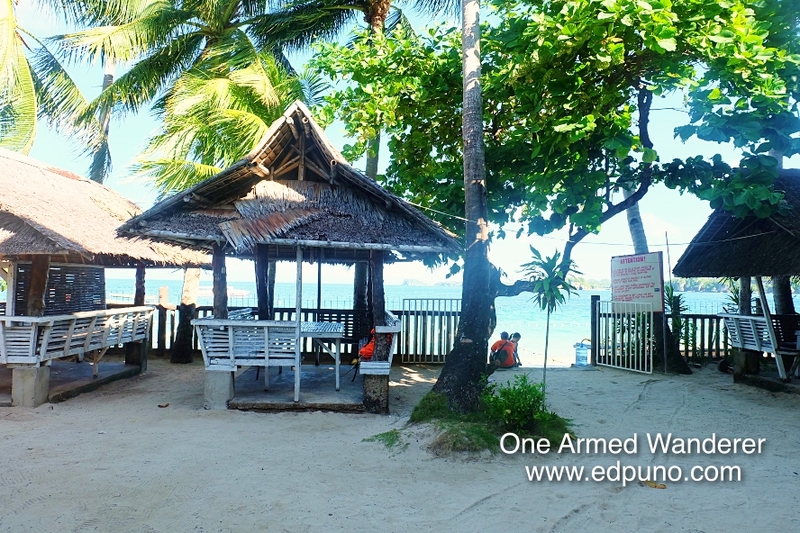 If you do not have plans to stay overnight, Raymen Beach Resort has picnic huts ranging from 400 Php to 750 Php a day. Our room was a family room facing the beach. We booked a bit late prior to our trip and the family room is the only remaining room in Agoda. Too bad, we were clueless that Raymen Beach Resort has cheaper rooms. Tip: Family room facing the beach is 4,500 Php and we booked it at only 3,373 Php. You too can enjoy huge discount if you book your Raymen Beach Resort room HERE. Our room is very spacious. It has one double bed and one queen bed. The room is air-conditioned and also comes with a cable TV, dresser and a dining set. It is also one among the few rooms in Raymen Beach Resort having intercom. Meaning, you can call the resort’s restaurant to order food and it will be delivered in your room! The toilet & bath is spacious too. Basic toiletries such as soap, toilet paper and towels are provided. Toilet could have been better if it includes bidet. Nonetheless, there is a hot & cold shower. Overall, the room is generally clean. Not the type you get to experience in high-end resorts but is truly value for your money! There are various restaurants in Guimaras but Raymen Beach Resort’s is a must visit when you are going to the island. They offer a wide array of food choices on their menu at an affordable price! I didn’t really expect that their restaurant serves delicious food as they are cheaply priced. 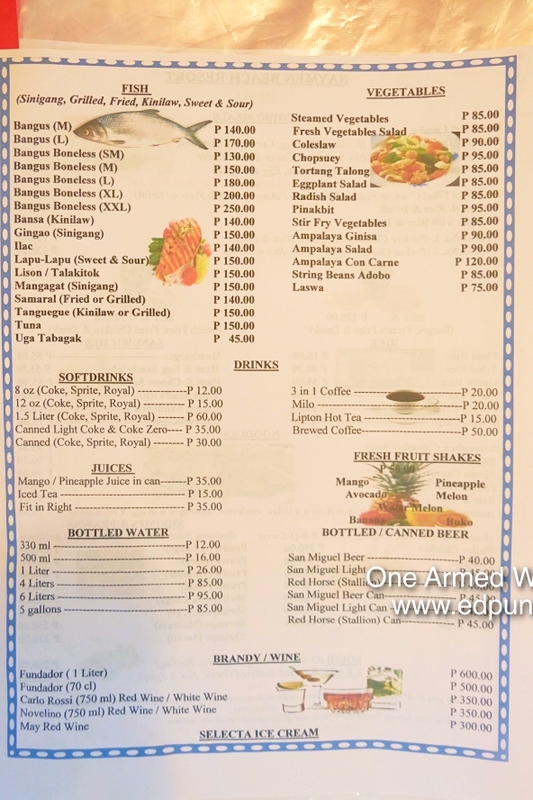 We have tried dining at the expensive Danilo’s restaurant in Andana Resort Guimaras. I should say that Raymen Beach Resort’s restaurant definitely serves better tasting food. Upon checking-in, we immediately ordered lunch. Instead of eating in the restaurant, we requested our food to be delivered on our room. 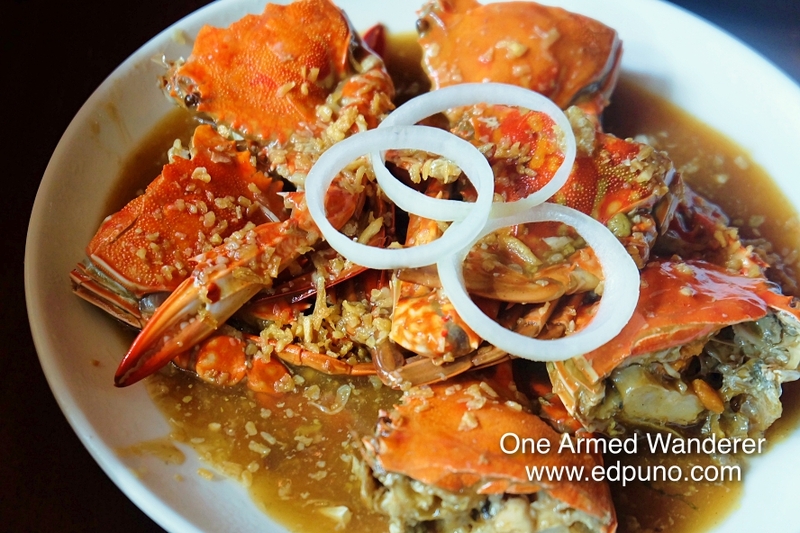 We enjoyed the crabs and pancit canton! 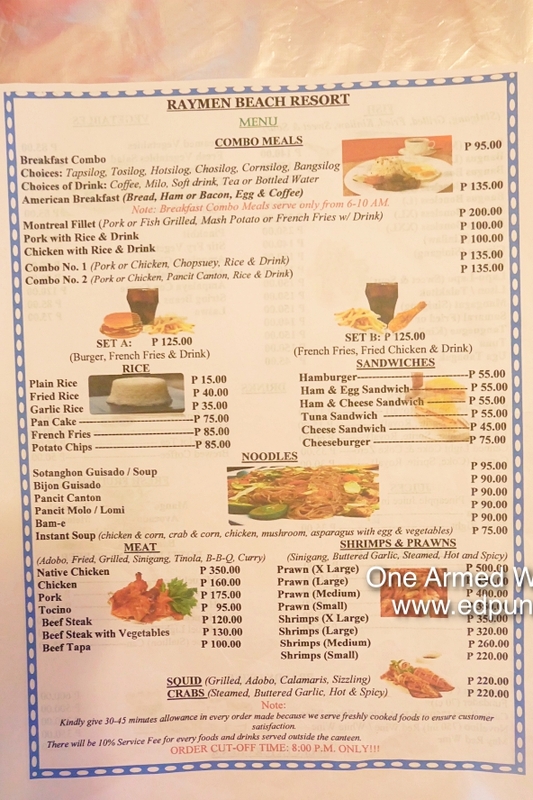 For our breakfast, we ordered tapa and chorizo meals for only 95 Php each! Since we loved Raymen Beach Resort’s restaurant, we even decided to have our lunch there after checking-out. Itinerary of the island tour are Fairy Castle, Baras Cave, Ave Maria Island, Sea Turtle Sanctuary, Natago Beach Resort, Lamurawan Beach Resort and Isla Naburot.